Every supermarket carries a variety of beef roasts, and often the labeling can be confusing, especially if you don't know the steer primal from which the roast is cut. The following beef roasts -- with photographs from a butcher's block and recipes -- are the roasts you'll frequently find in a market or butcher. 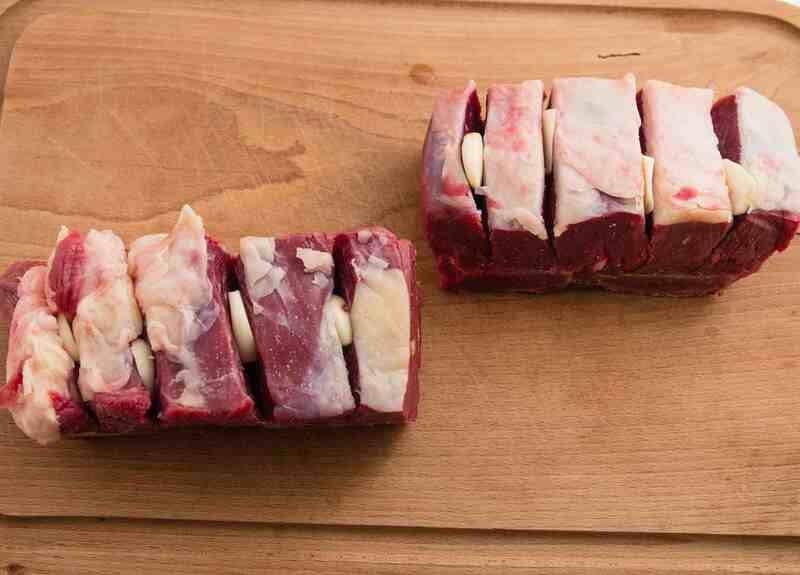 Chuck roast is cut from the cow's shoulder. It is a heavily exercised muscle, which gives the beef good flavor but it also makes it tough. Chuck is often ground for hamburger because of its high ratio of fat to meat (20% fat to 80% meat is considered the best for a hamburger). Chuck is used for a ​pot roast or, when cubed, stew, because the connective tissue melts as the chuck braises and self-bastes the beef, making it very tender. Other roasts cut from the chuck are Boston Cut and English Roast or Cross Cut. The economical eye of round roast is cut from the rear leg of the beef steer or heifer. It is similar in appearance to the tenderloin, but because it is cut from a well-exercised muscle, the eye of round is lean and tough. Eye of round can be cooked with high-heat searing and slow roasting, braising, simmering or poaching. However, because it is very flavorful, it can also be cooked as roast beef. Like with other tough cuts, the eye of round should always be thinly sliced against the grain. A rib roast is cut from the rib section between the shoulder and the short loin (behind the ribs). The three most common rib roasts are Standing Rib Roast, Rolled Rib Roast and Rib-Eye Roast. The Standing Rib Roast is cut with at least three ribs and up to seven ribs and roasted propped upright on its ribs, which allows the meat to be self-basted as the roast's top layer of fat melts. Standing Rib Roast is often referred to incorrectly as Prime Rib Roast. The majority of USDA Prime is bought by hotels and meat distributors, so carefully examine the label to make sure you're buying true prime. Rolled Rib Roast is the same cut as the Standing Rib Roast but with its bones removed and the meat rolled and tied into a cylindrical shape. The Rib-Eye Roast is the boneless center cut of the rib section. Very well-marbled, tender and flavorful, it is the most desirable and the most expensive of the roasts. The Top Round Roast is cut from the upper thigh of the hindquarters of the beef cow. The top round is not a heavily worked muscle, which results in a roast that's more tender and flavorful than other cuts from the round. Top round is often mislabeled and sold in supermarkets as London Broil, which is not an actual cut of beef but a method for cooking tough cuts. Top round roast can also be braised, roasted or stewed. Rump roast is a triangular cut from the upper part of the round or the hindquarters. Like other well-exercised muscles, the beef is lean and flavorful, but because it can be quite tough, the rump roast should be cooked slowly at lower temperatures (such as the pictured pot roast), which allows time for the cut's connective tissue to soften and melt. The sirloin tip roast (also known as round tip roast) is cut from the hindquarters, adjacent to the sirloin. The sirloin tip roast is flavorful, but like most lean cuts, it can be tough and should be braised or stewed. The sirloin tip roast can also be used for kebabs or slowly oven-roasted at a low temperature.